To install AutomatiCloud you first have to unpack the setup file you have downloaded. Now you can start the setup program. AutomatiCloud needs .Net Runtime 4.5.2 or newer and a permanent internet connection to call the AWS web services. The CPU / memory footprint is very small. You can even install it on a free t2.micro EC instance. The AutomatiCloud background service is installed as a windows service and set to “Automatic (delayed start)”. It will start shortly after all other services are started and will execute all your jobs in the background. You don’t have to keep the User-Interface open. If your background service is down for any reason when one of the job triggers should fire, your job will not be executed. The next time you start the background server it will try to catch up and fire all triggers for missed backup jobs (EC2 and RDS) once. Missed start or stop jobs will not be fired (since V3.1.552). To do the administration of your jobs start the AutomatiCloud User Interface by double-clicking the icon on your desktop. When you start the user interface for the first time it will ask you for AWS credentials to access resources. Assign the following rights to a role and assign this role to the new account (updated for Version 4.0). Enter the newly created access key, secret key and select the region where your resources are located. 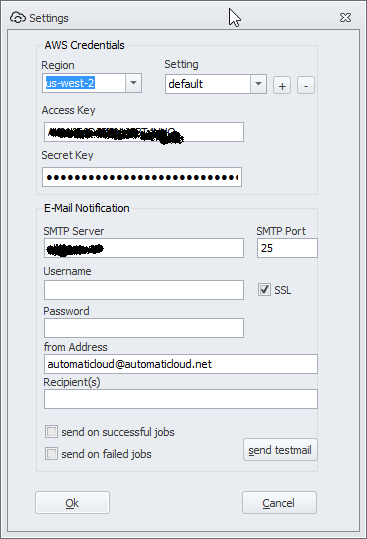 If you want AutomatiCloud to send out notification mails after job execution you can enter the parameters of your mail server here. With the “send testmail” button you can test your settings. By checking the “send on successful jobs” option you will receive mails for all jobs that where executed with out an error. By checking the “send on failed jobs” option you will receive mails for all jobs that where could not be executed because of an error. All this information is stored in one “default” setting. If you need more than one setting you can add additional settings by clicking on the “+” sign on the upper right corner of the setting dialog. Multiple settings can be helpful if you have resources in different regions, need different accounts to access them or want to send notifications to different recipients. Every job you will later add will have one of these settings associated and use the parameters stored here.